4 mins each station non stop, 1 min rest inbetween swapping stations. continue until all done. A - quick movement slalom between cones then quick sprint around pole jog back, no walking and continue. B - doggies, when back to starting off cone quick sprint around pole and jog back, continue. 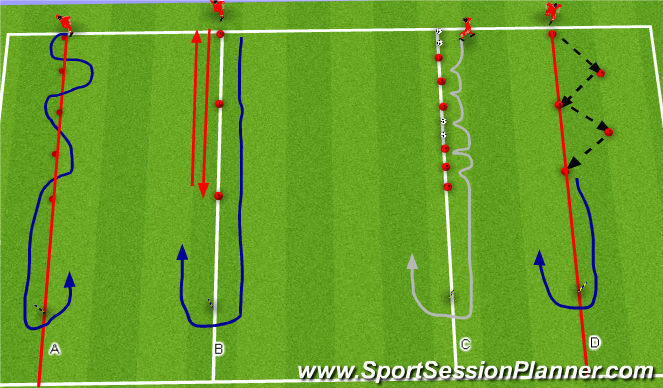 C - quick tap feet on balls then inbetween cones at the end sprint around pole and jog back, continue. D - Jump from one cone to other but off one foot and land only on another foot, not both feet, balance and strength for distance, then quick sprint around pole and continue.